Felony crime in the 112th Precinct is up slightly compared to last year, the precinct’s commanding officer reported last week, but that’s largely due to weather and changes in assault law, he said. 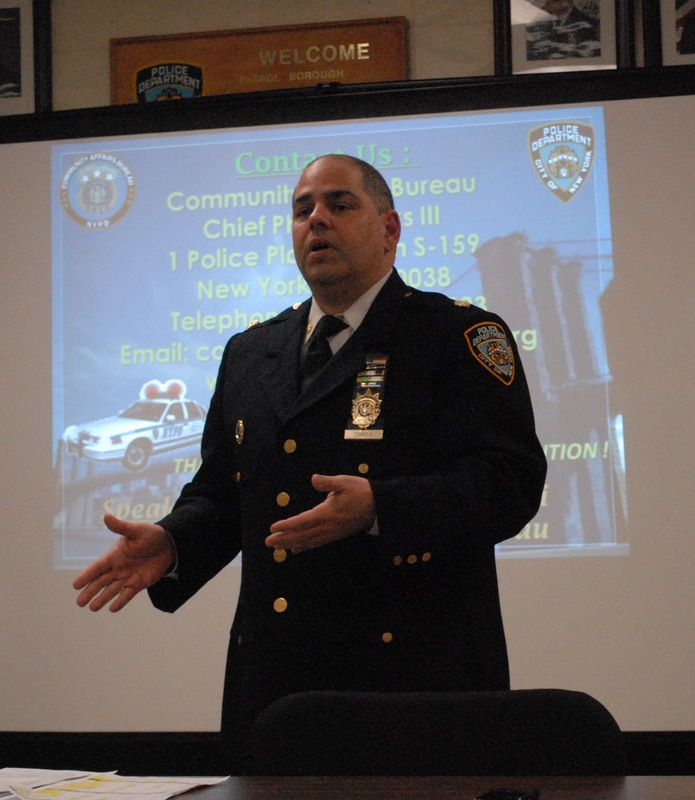 Deputy Inspector Christopher Tamola, told members of the local precinct council at its meeting March 22, that there have been 176 crimes this year compared to 168 at this time last year—a 4 percent increase. He emphasized though that his patrol area—spanning Forest Hills and Rego Park, has the second lowest amount of crime in the borough. To help prove his point, he said there had been 11 auto thefts this year, which is the lowest amount in Queens. Deputy Inspector Christopher Tamola, commanding officer of the 112th Precinct, told Forest Hills residents that there’s been a small bump in crime this year due to changing laws and weather. Forum Newsgroup photo by Jeremiah Dobruck. this year compared to 27 last year at this time. “Our burglaries are down—again, least likely to get your car stolen and least likely to get your home broken into in the 112th precinct,” Tamola said. He said that this year’s burglaries have spiked in the last couple of weeks because of the fair weather. He warned attendees to keep windows closed when they’re out of the house. “In fact I came home the other day and yelled at my wife for leaving the windows open,” he said. Theft of property in the precinct is sitting about even at 95 compared to 94 at this time last year. “That was the one crime that really put us over last year,” the deputy inspector said. Tamola said this is one crime where a little vigilance can really help police. He pulled out a stack of complaints that he said he wouldn’t have had to take if someone had been a little more careful with their belongings. Robberies in the precinct have so far declined with 21 compared to 24 at this time last year. “The one crime we have a significant increase in is felony assault,” Tamola said. The 112th sits at 22 so far this year compared to the 18 it had at this time last year. “Of those 22 felony assaults, 12 are domestic and all 12 of those are closed to arrest.” Tamola said—noting that police have made arrests in all but one of the assaults overall. He painted the increase though as not an increase in violence, just a change in how crimes are recorded. “Even though we are significantly up, they have changed the law in the last couple of years on felony assaults. What used to be a misdemeanor assault is now a felony assault,” he said. Tamola told the crowd that if someone 65 years or older is assaulted by someone who is 10 years or more younger, it’s automatically a felony. Additionally many uniformed city workers like bus drivers and traffic safety agents have added protection under the law classifying crimes against them as felony assaults. Those rules, plus a regulation that any attempt to choke someone is automatically a felony assault, have bumped up the number, Tamola said. The most extreme violence has been avoided in the 112th though. “There have been no shootings; there have been no homicides in the 112th, hopefully we continue that,” Tamola said.